Elsevier, a world-leading provider of scientific, technical and medical information products and services, and the IU Richard M. Fairbanks School of Public Health at Indiana University-Purdue University Indianapolis today announced that HIMSS (Healthcare Information Management Systems Society), an international not-for-profit organization focused on better health through information technology (IT), will award its 2016 Book of the Year Award to Health Information Exchange: Navigating and Managing a Network of Health Information Systems. Edited by Brian E. Dixon, PhD, FHIMSS, an Associate Professor at the IU Richard M. Fairbanks School of Public Health and Research Scientist at the Regenstrief Institute, the book was published in March 2016 by Elsevier’s Academic Press imprint. 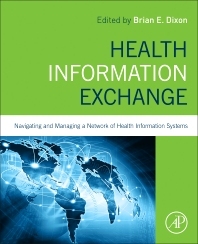 Health Information Exchange confronts the opportunities and challenges associated with the electronic exchange of data and information across the complex network of hospitals, clinics, pharmacies, and other entities involved in providing health care. While the last decade has witnessed tremendous growth in the proliferation of IT in health care, many find it complicated and frustrating to connect those systems in a way that delivers high quality, patient-centered care. Described as a “timely response to a critical need within the health system” by Charles E. Christian, FHIMSS, CHCIO, the Vice President for Technology and Engagement at the Indiana Health Information Exchange who nominated it for the award, the book chronicles the need for and progress towards interoperability among health information systems as well as the methods and tools necessary to enable seamless, nationwide exchange of health information no matter where a patient receives care. Experts and accomplished practitioners contributed to the book’s chapters and its several case studies that detail how leading organizations are moving the needle with respect to health care delivery and outcomes. Editor Brian E. Dixon, PhD, FHIMSS, teaches and conducts research in the area of public health informatics, which applies information and computer science to improve population health monitoring as well as outcomes. Prior to joining the faculty at IUPUI, Dr. Dixon was an accomplished computer programmer as well as IT project manager who developed and implemented technologies that are now used by more than 100 hospitals and 20,000 physicians to exchange data necessary for caring for individual patients as well as monitoring the health of Indiana communities via the Indiana Health Information Exchange. Dr. Dixon has published more than 50 peer-reviewed publications and serves on multiple advisory boards for governmental and non-profit organizations who seek to use information technology to improve care delivery and health outcomes. Dr. Dixon was named to the “Forty Under 40” list in 2014 by the Indianapolis Business Journal and an Outstanding Investigator by the Regenstrief Institute’s Center for Biomedical Informatics. He was named a HIMSS Fellow in 2012. The award will be presented to Dr. Dixon at the HIMSS Awards Gala, on February 21, 2017 at Loews Portofino Bay Hotel at Universal Orlando. The gala is one of the premier events held during the 2017 HIMSS Conference & Exhibition, from February 19-23, at the Orange County Convention Center.